As the weather turns warmer we find ourselves craving something cold to drink. Joe and I enjoy a cold smoothie after a long walk or after working in the yard. 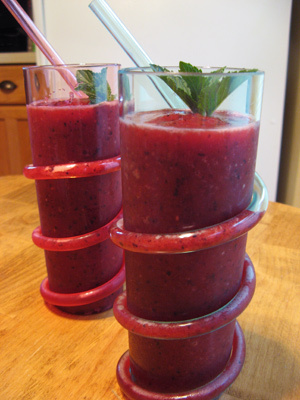 These smoothies are very low in calories but they will satisfy your taste buds and replenish your energy. I found this recipe in an old Cooking Light magazine and it’s so simple with only four ingredients yet it’s packed with flavor. If you’re a fan of lemon and berries you’ll definitely love this.